An entry like Rogue One is pretty risky in a series like Star Wars. These movies are built on formula and repetition (George Lucas famously insisted that The Phantom Menace was supposed to “rhyme” with A New Hope) and rarely take bold dramatic leaps. Sure, fanboys like me know about the decades of novels and video games — now de-canonized by Disney — that fill in continuity gaps and tell the tales of characters and events not covered by the main series. But releasing the first cinematic Star Wars story not exclusively focused on the exploits of the Skywalker family is a big deal. 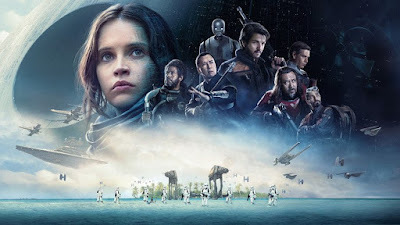 Hell, that Lucasfilm actually green-lit another Star Wars prequel showed serious balls, and their insistence that Rogue One would be a WWII-style epic demonstrated their willingness to at least crack (if not entirely break) the mold. 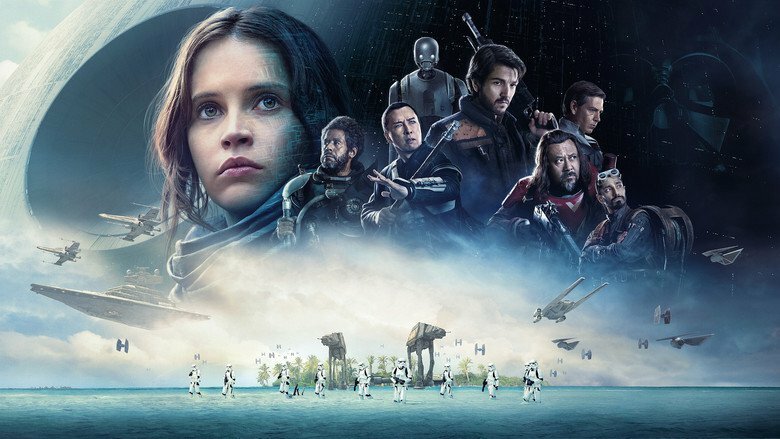 They may not necessarily have succeeded — three viewings in, and I still think Rogue One is a bit of a mess — but the film’s value in the Star Wars lore comes from its ability to strip the series of its moral compass and ask serious questions about why we fight these wars in the first place. When we catch up with Leia and the droids in A New Hope, we’re told that the fledgling Rebellion has just won its first major battle against the evil Empire. There are clear lines of open conflict between the two factions. Same with The Phantom Menace: the Trade Federation is blockading Naboo with the intent to provoke the Galactic Republic into a confrontation. The Jedi Knights serve that Republic. Darth Vader and his troops serve their Empire. They have clear goals. 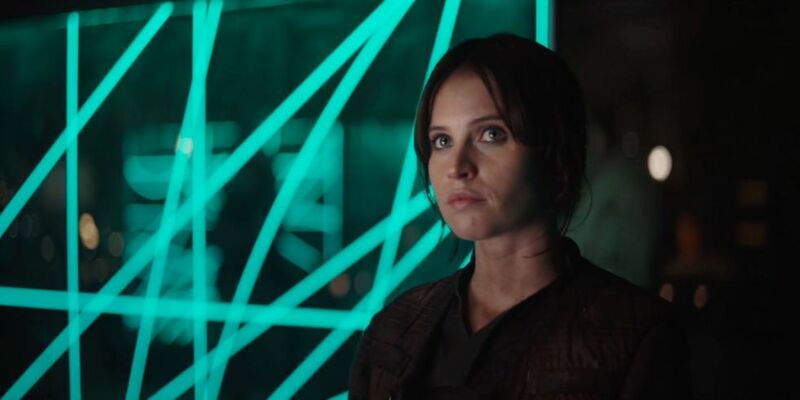 When Rogue One begins, however, things are a bit murkier: the Rebel Alliance exists in theory, but they’ve yet to come to an agreement on basic ideology, let alone to stage a significant attack. Saw Gerrera’s (Forest Whitaker) militant extremism has driven him away from his revolutionary peers and into hiding, and the Empire’s devastating response to his tactics has made the Council hesitant to reveal themselves for fear of the same retribution. 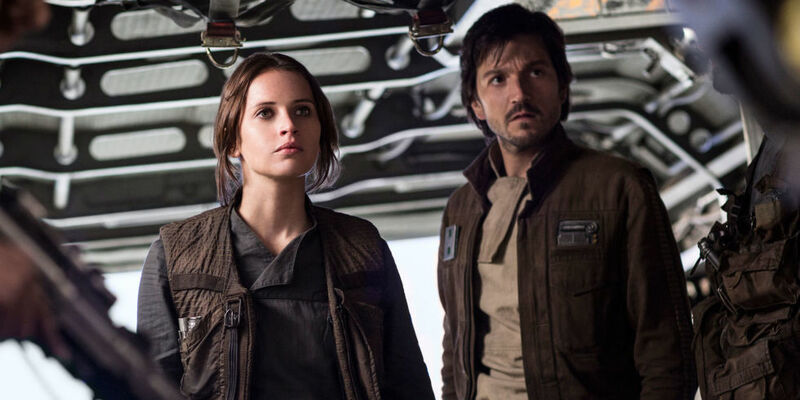 The Rebel vanguard (among them Diego Luna’s Cassian Andor) is scattered and disillusioned – they know something has to be done, but no one seems to agree on how best to do it. Of course (and as always), this discord also extends to the Empire. First, there’s Galen Erso (Mads Mikkelsen) —Star Wars’ J. Robert Oppenheimer — forced to compromise both his principles and his genius in order to save his family. Next, the sniveling Director Krennic (Ben Mendelsohn) expects his supervision of the Death Star project to propel him up the ranks, specifically past his chief rival, Grand Moff Tarkin (creepy uncanny valley version of Peter Cushing). Krennic is a fascinating character deserving of much more than the time Rogue One affords him: his obsession with unilateral force (exemplified in the Death Star itself) illustrates the Empire’s key weaknesses and foreshadows its eventual demise. Krennic is great because he gradually discovers that subordinate infighting breeds inadequate leadership and, though his scene with Darth Vader feels forced and yields nothing of narrative importance, it shows how frustrating it can be to serve masters with limited and indistinct visions. Speaking of Vader, the Dark Lord of the Sith’s super depressing bachelor castle on Mustafar could be read as a sign of his conflicted state of mind, a kind of forced exile into the very evil that corrupted Anakin Skywalker in Revenge of the Sith. 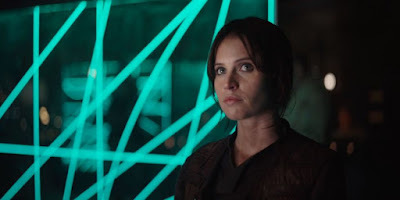 Which brings us to Jyn Erso (Felicity Riske-Jones), a pretty good Star Wars character who should have been great. Jyn’s damage stems from her first two distinct memories, both of which involved her abandonment by those tasked with caring for her. Retreating after her mother’s murder and her father’s apparent betrayal, Jyn is taken into the stewardship of Saw Gerrera. Years later, when Saw senses that Jyn’s true identity is no longer a secret and may compromise his rebellion, he kicks her to the curb to fend for herself. From there and throughout Rogue One, Jyn’s guarded cynicism pushes her to reject institutional cooperation (the Imperial flag flying above them “isn’t a problem is you don’t look up”) until the film’s final act (“I’m not used to people sticking around when things go bad”). Indeed, nearly the entire crew of Rogue One has lost their faith: Baze (Wen Jiang) is a reformed Force worshipper, Bodhi (Riz Ahmed) a defecting Imperial pilot, and Cassian, the Rebellion’s blunt instrument who’s growing tired of following orders he doesn’t believe in. His confrontations with Jyn over her father’s message* and his actions on Eadu are the pivot points of the entire series, building the trust that pushes the pair to act when so many Rebels have remained passive. The almost meta-textual irony is that Rogue One’s muddled, focus-grouped-to-death vibe makes its valuable role in the overall saga that much harder to see. But it’s there. While the film is fighting itself to be a film about groups fighting themselves, it’s telling a really interesting story about the ways we learn to set aside apprehensions in the service of a larger goal. The Rebel Alliance becomes truly unified when it attacks the Imperial fleet over Scarif, a move it never would have made had Jyn’s team not seen what others could not. This unity makes the team’s sacrifice more meaningful; they’ll never see the fruits of their labor (“Do you think anybody’s listening?” Cassian asks after transmitting the Death Star plans), but their personal catharsis — that at-long-last confidence that they’re fighting a battle worth dying for — paves the way for the inspired and sure-footed heroism of Luke Skywalker, Han Solo, and the entire Star Wars saga that would follow. It pushes Darth Vader into final conflict with himself and his legacy, which in turn gives Rey and Kylo Ren a buried mythology to discover. It’s messy, but it matters. *If only Saw had been there to back Jyn up! Too bad he was busy dying for no reason at all! Well said, Rob. I love Rogue One, warts and all. Disney takes a lot of crap, and a lot of it is deserved, but I think the chances taken in Rogue One, along with its subsequent success, will dictate the direction of Star Wars moving forward. Even more than the numbered sequels. Great read and great insights. A thoughtful, interesting piece! Too bad none of these Galactic Civil War "pivot points" really matter, because Han and Leia's only kid became a school shooter, Luke went into exile just like Yoda did, and the Empire rose again, murdering several planets in the process. But it's okay, because Rey is plucky and cute, Finn is plucky and likable, and Poe is roguish and charming! The Force Awakens is violent, upbeat fun for the whole family! The character development is still lacking. I've heard the argument that it's meant to be weak because of what happens to them, but isn't that just a poor, convenient excuse for a lackluster script in this instance? The emotional resonance that is typically felt throughout the series just doesn't exist here for me. It's serviceable and for lack of a better word...fine, but they weren't willing to take any real risks to make is stand out or reach 'special' status. i don't think the argument that they're meant to be weak is true. i think the problem come from the rewrite and reshoot they did. if you look at the first teaser they released, most of the shots in that trailer are not in the movie. @El Gaith, i don't count the animated movie as part of the prequels, but i understand why you would. i also think TFA is shiny, but soulless, i also disagree. El Gaith - I wasn't really addressing anyone with my comments. I had only recently seen Rogue One and hadn't really gotten a chance to talk about it, so I guess I wanted to give my opinion. I wanted to like Rogue One, always been a fan of the Star Wars movies, but I just didn't find myself caring for these characters. Jyn Erso was especially disappointing, if it hadn't been for Mikkelsen's 'Galen' performance, I don't think there would have been enough depth there at all. This is the problem with the idea of this movie though. To create an entire cast of characters that don't exist in Episode 3 or 4, and make us care about them within a 2 hour window is nearly an impossible task. Sure, I care about what they're trying to accomplish, but I didn't find myself caring about whether they lived or died or if they accomplished any personal goals before they meet their demise. I will give them credit for a solid effort and I would be lying if I did not admit I had some fun with it. I just don't see myself returning to it as often as the others. I come back to the other Star Wars films to spend time with characters that I love. 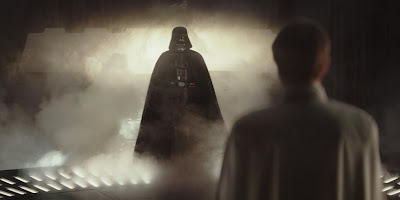 It's not a good thing when people are leaving 'Rogue One' and all they can talk about is Vader, Leia, and Tarkin is it? Great article Rob, you definitely helped me find a little more purpose in this film that lies on the surface. *than lies on the surface. Thanks for reading and for your thoughts, Kersey! I agree with a lot of what you said, which is one of the reasons I (as a Star Wars fan) really wanted to figure out what makes Rogue One so frustrating. And like you said, it's the characters. I like each of these people in theory, but the film does so little to develop them that I couldn't help but be disappointed. Part of writing this article was about coming to peace with RO as an imperfect (but still valuable) entry in the series. Rogue One is much more of a war movie than any of the Episodes have been. I wouldn't go so far as to say that it's in a whole different genre, but it's similar to how Ant-Man is a heist movie while The Incredible Hulk is a fugitive/chase movie, while both are superhero flicks. All Star Wars movies are space fantasy, but Rogue One emphasizes the war part, with characters that are professional fighters. As a veteran (though not a combat veteran), I can appreciate and respect the military mindset at play, even if the Rebellion is more of a fragmented militia, and the protagonists more guerilla ("Gerrera") fighters than professional soldiers. In order for a military to work optimally, one must to some degree adopt an automatic bond and assumed camaraderie with your fellow members, even if you've never met them; they don't call it a "Military Family" for nothing. So on that level, I was automatically invested in the protagonists and their mission to some degree. Which isn't to say that just being about hardened fighters makes a muddled script better, or that anyone is wrong for not connecting to it themselves. Just an observation. In any case, I liked Jyn a good deal better than Rey (for instance) because she was a flawed character. (See Film Crit Hulk on how Rey lacks depth due to an absence of evident personality weakness.) Jyn knows things are terrible, but doesn't want to fight back at first because she vividly knows just how fragile her own life is. A similar dynamic makes me far prefer His Dark Materials' Lyra to Hermione Granger - Lyra is hot-headed and ill-mannered, whereas Hermione is... uh... not great at sports? Plus, Lyra Belacqua never contrived to have a hated teacher raped by centaurs. I'd forgotten about that! Then again, I didn't grok the implication of that scene until a Cracked article spelled it out.